The north of England is known for its wet weather, but the RHS could not have predicted winds of up to 40mph (64kph) when planning its new summer flower show in the grounds of Chatsworth House in Derbyshire. 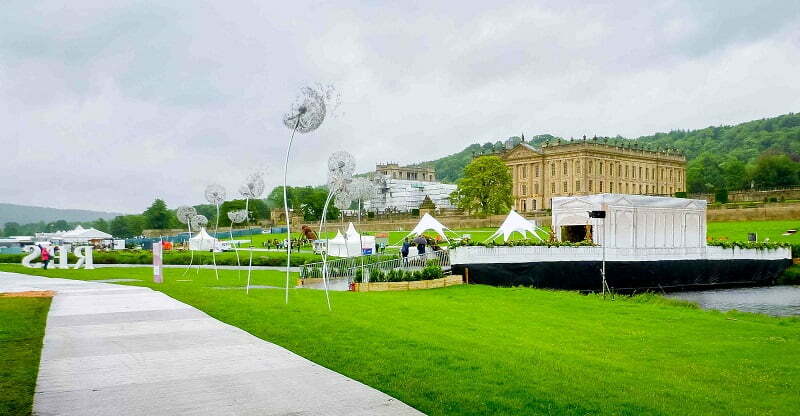 Despite an early closure on press day due to health and safety concerns caused by very high winds, and long delays on members day due to car parking on sodden ground, the new RHS Chatsworth Flower Show is set to be another jewel in the RHS crown. The show was set against the stunning backdrop of Chatsworth House, which many might recognise as Mr Darcy’s Pemberely Estate in the 2005 film of Pride and Prejudice starring Keira Knightley. The 1,000 acres of parkland surrounding the house was landscaped in the mid-1700s by Lancelot ‘Capability’ Brown for the 4th Duke of Devonshire. The flower show straddled the River Derwent, which weaves its ways past the west side of the house. Temporary bridges were created to allow visitors to cross the river, including a Palladian-style bridge decorated by celebrity florist Jonathan Moseley. The centerpiece of the show was a representation of the Great Conservatory designed by Joseph Paxton while head gardener at Chatsworth. On its completion in 1840 it was the largest glass building on earth. It housed a collection of exotic plants, trees and tropical birds and was heated by eight boilers fed by seven miles of pipe. 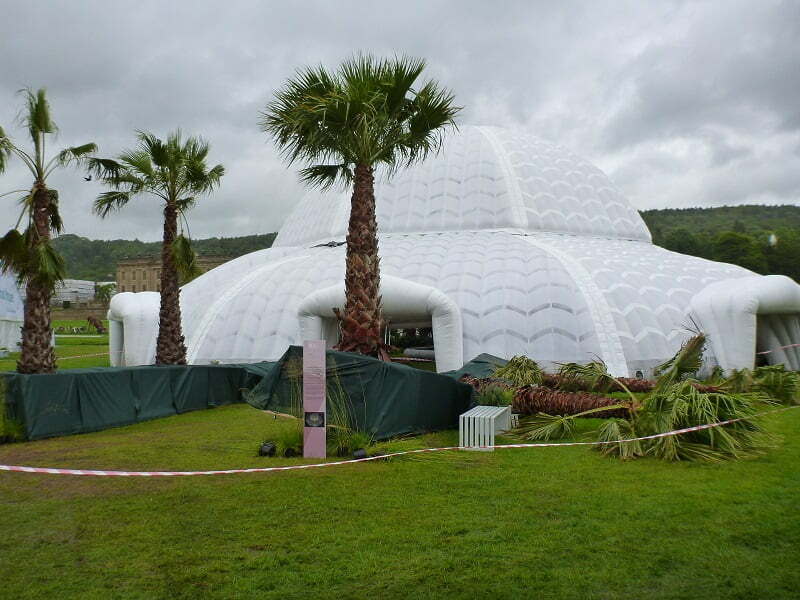 The RHS’s version was a 14-metre high inflatable dome, measuring 40m in diameter and installed over five days using a 130-ton crane. The Great Conservatory with giant palm trees blown over by strong winds on press day. 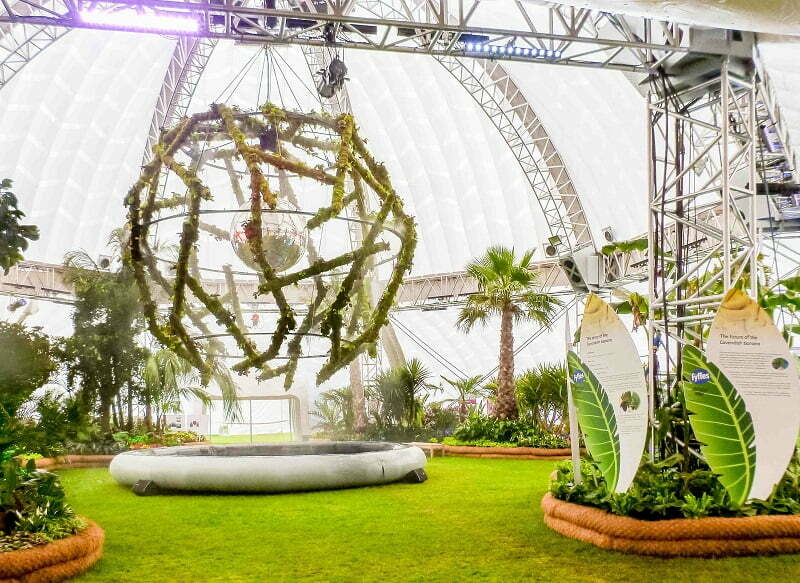 Inside were more than 40 large architectural trees and palms, 5,500 tropical plants, 300 banana plants and an installation by Cityscapes exploring creative ways to grow plants using contemporary methods. Visitors could also immerse themselves in a virtual reality reimagining of what the Great Conservatory would have been like in Paxton’s day. Inside the impressive dome of the inflatable Great Conservatory. An avenue of nursery stalls waiting for eager shoppers to arrive. 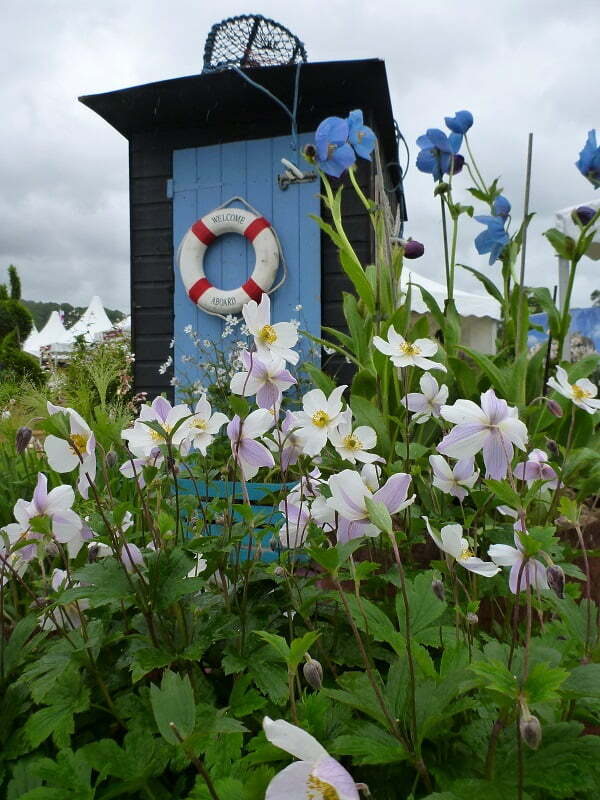 A lifebuoy on the display for Dominic Kaye Plants might have been useful if the rain had continued. The show introduced a new category of unjudged gardens to encourage freedom of expression and celebrate the connection between plants, sculpture, art and people. These gardens were a little more creative and unconstrained by the rigors of fulfilling the judging criteria. 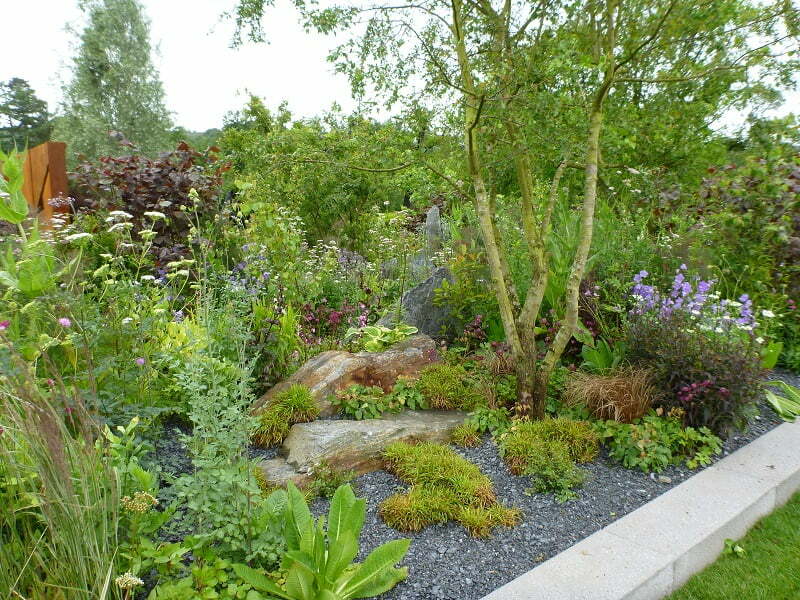 There were eight FreeForm gardens which varied dramatically in style and size. 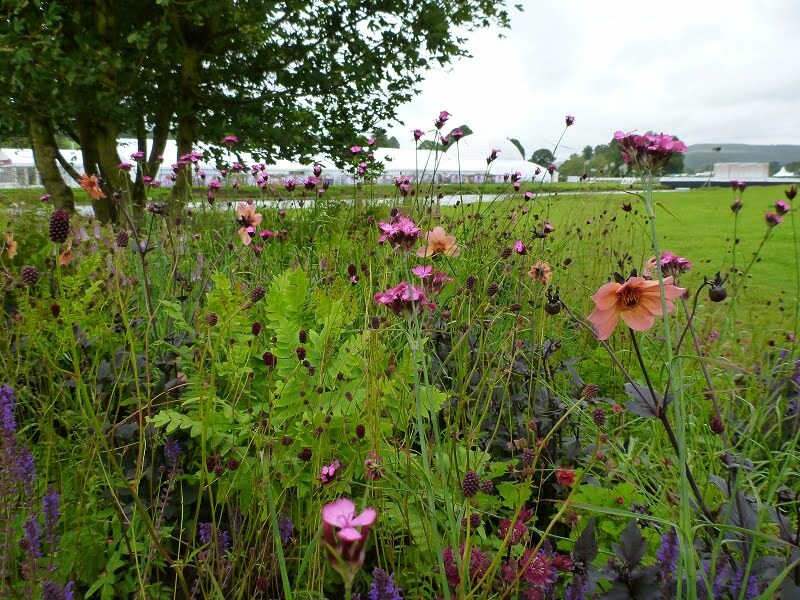 By far my favourite was the Brewin Dophin Garden by Jo Thompson, with its rich, moody colour combinations that would be easy to recreate at home. I wasn’t the only one impressed, as it won the People’s Choice award in the FreeForm category. 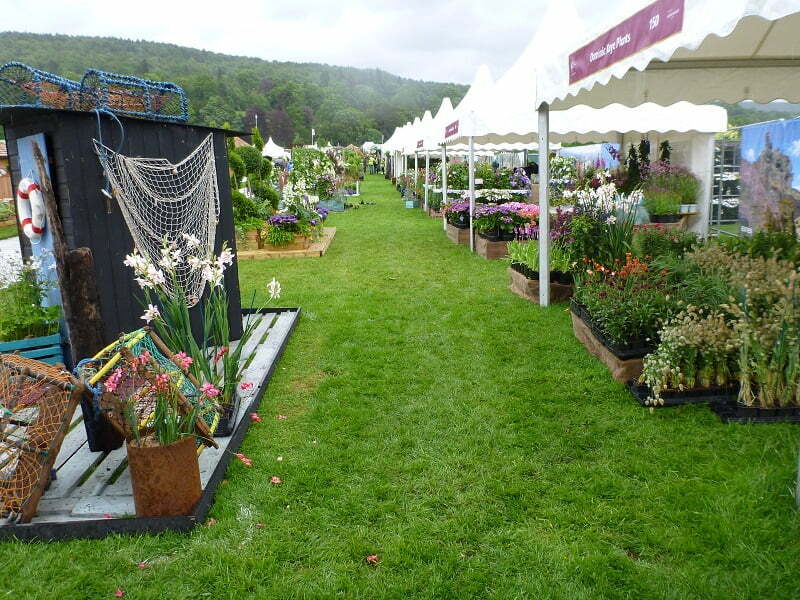 View from the Brewin Dolphin Garden over the River Derwent to one of the two giant Floral Marquees on the other side of the show ground. 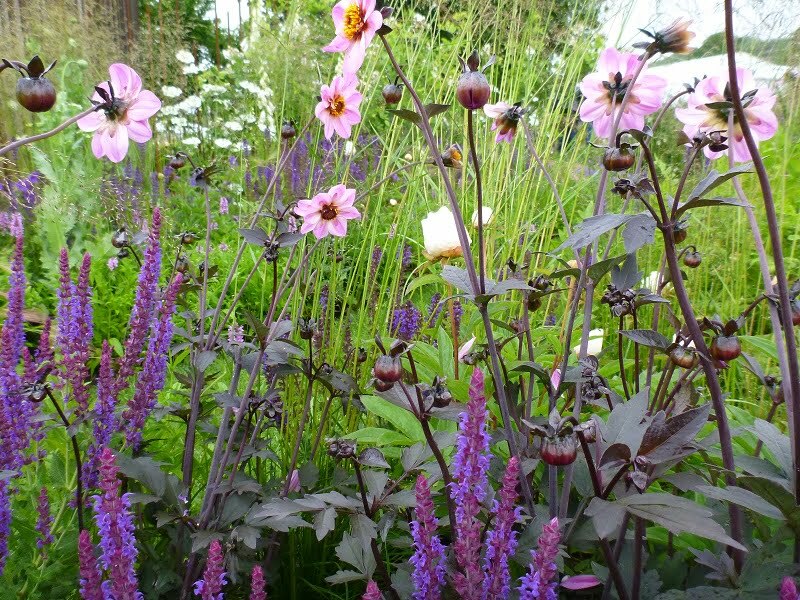 The rich purple spires of Salvia Mainacht look vibrant against dark-leaved dahlias. The undulating curves of a rusted steel sculpture and sweeping mown paths echoed the shape of the River Derwent, which it ran alongside. The steel sculpture at one point hung over the water before turning back and curling tight around a steel building. Hornbeam trees and field maples were underplanted with wildflowers, which blended seamlessly with areas of everyday perennials planted as if they were in a wildflower meadow. Dark-leaved dahlias were an unexpected but sumptuous addition. Wildflowers under tree canopies and sweeping mown paths. 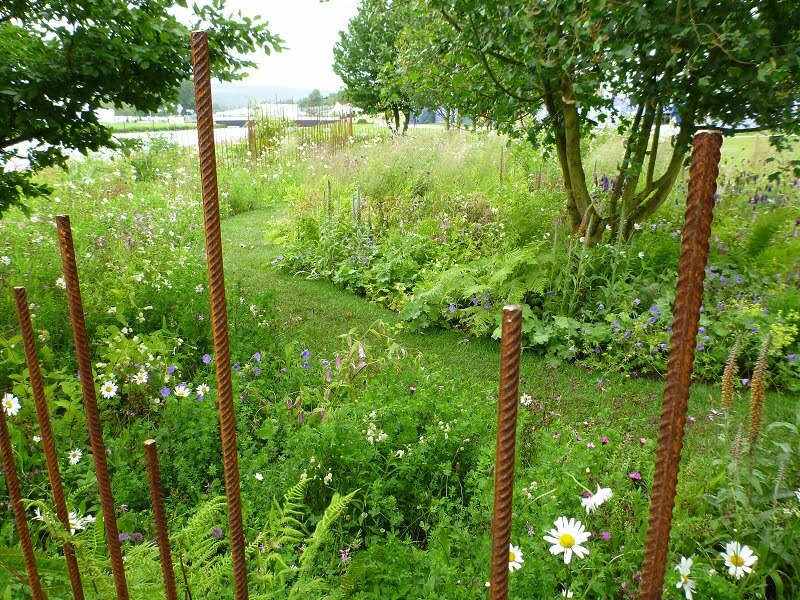 The rusted steel bars rippled through the garden, giving it structure and movement without blocking the view. The overall effect was soft and relaxing, but never boring. The different areas of planting, and the anticipation of what might be around the next curve, made you want to wander endlessly around. My only slight irk was the introduction of candelabra primulas nearest to the water’s edge. Although perfectly fitting for a riverside, I didn’t feel that in a real garden they would enjoy the same growing conditions as their companions. However, that is a very minor quibble about what was an inspirational garden. After spending far too long wandering around the Brewin Dolphin Garden on my way to the main show gardens, I was distracted and confused by two giant cubes joined by acrylic panels containing floating paper, with an avalanche of boulders to one side. It transpired that this was another of the FreeForm gardens. I love a bit of structure or art in the garden, but I’m a plantaholic and in my view The Wordless Cupboard by Sheena Seeks was not a garden. Its message that ‘words equal power and without the ability to communicate, people become powerless’ might be worthwhile, but I do like to see at least some plants at a flower show. Sorry, I couldn’t even bring myself to take a photograph of it. Fortunately, the rest of the show did not disappoint. OK, so not many plants in this one, but at least it was about gardening. More fitting for a flower show was Behind the Scenes, which paid homage to everyday tasks carried out by professional gardeners, the unsung heroes who work to plant and maintain gardens created by designers. 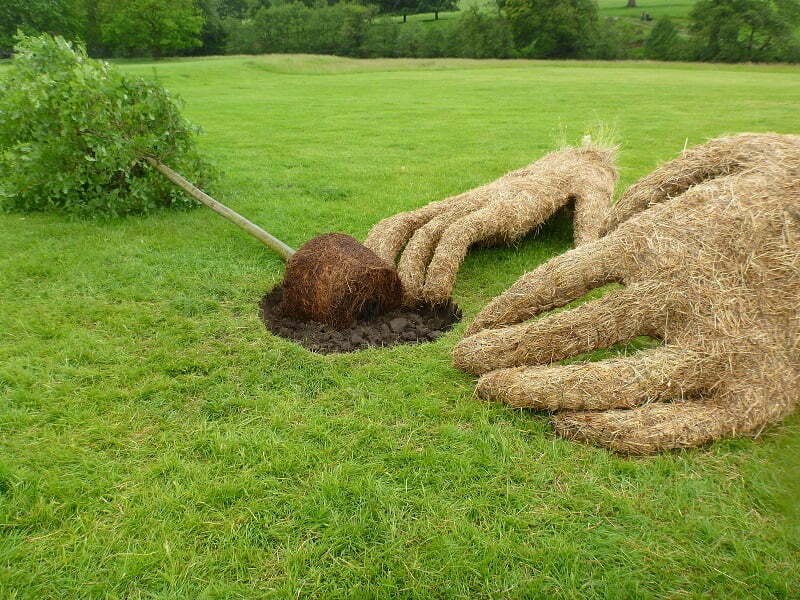 Two huge hands made of hay were in the act of planting an English oak tree. Thankfully the tree was meant to be lying down and wasn’t a casualty of the strong winds. What struck me was the ability to walk around all parts of the display, and the general spaciousness of the show ground. Eight show gardens competed for medals, six of them arranged in a circular design to represent a millstone. This allowed access to view the gardens from three or four sides, a huge bonus for the visiting public, although the grass was quickly becoming a mud bath even on press day. My personal favourite was Jackie Knight’s Just Add Water, which disappointingly received only a bronze medal. I’m a big fan of water gardens, which usually contain giant-leaved plants or weeping trees, but Julie’s choice of low-level planting was a revelation. The pink sandstone rocks and wide, shallow pool gave it a tranquil feel. It was a garden that you could take home. There was even a hammock to relax in, although not recommended in 40mph winds. I thought that it was beautifully executed and very fitting for the location, not least the title! Water cascading over pink sandstone into a large, shallow pool. 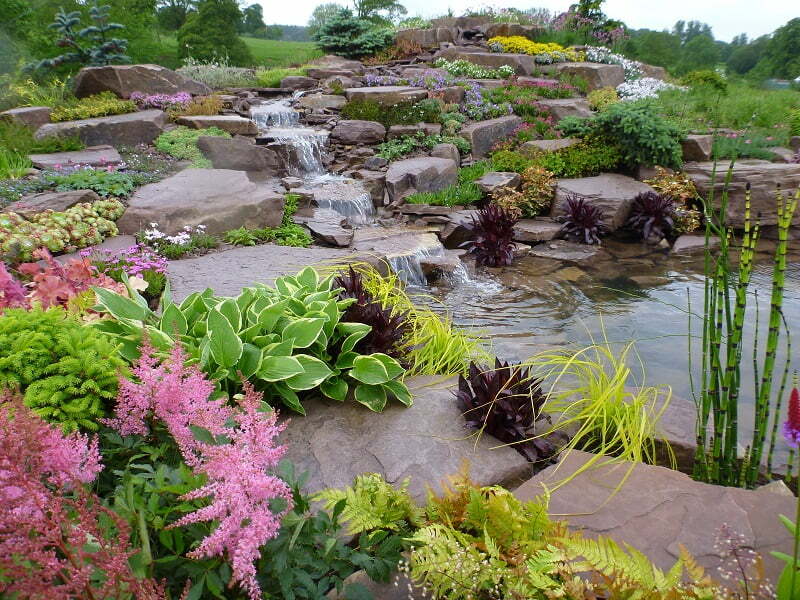 Alpines were planted around the top of the rock feature, with moisture-loving perennials on the lower levels. 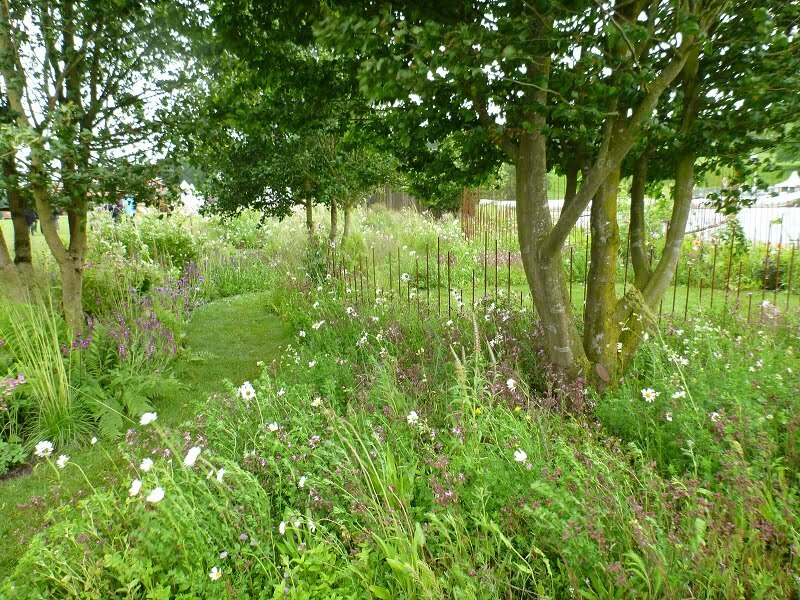 In a completely different style was The Wedgwood Garden – A Classic Re-Imagined, which won a gold medal. John Wedgwood suggested the idea of a horticultural society in 1801, which later became the RHS, but this was Wedgwood’s first ever show garden. 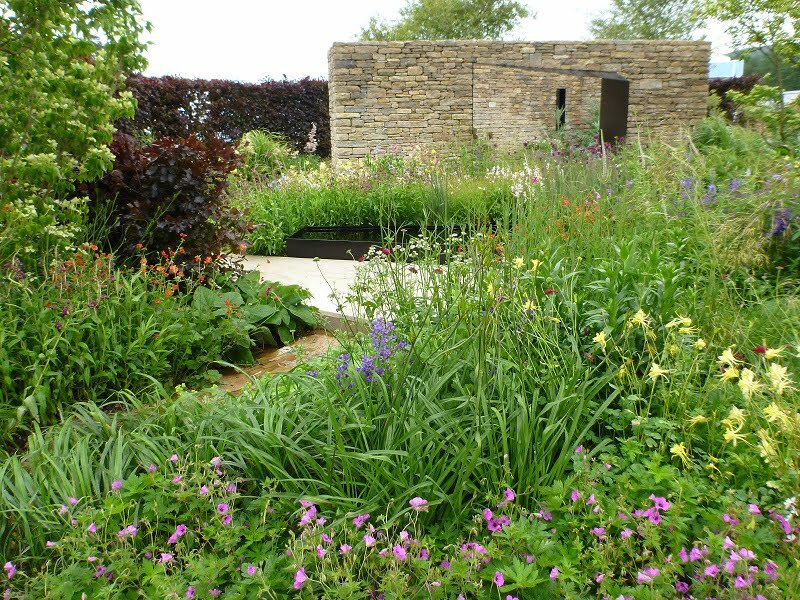 Designed by Sam Owens, who was RHS Young Designer of the Year in 2014, it contained classic cottage-garden style planting set against contemporary angular paths and structures. A dark, reflecting pool was a nod to the canals that were integral to the early success of the Wedgwood company. I liked that the pool was enclosed on three sides by dense planting, rather than being an isolated feature. Angular, concrete paths lead to the black reflecting pool, with a view through to the window seat in the dry-stone wall. The garden was dissected by two, beautifully constructed dry-stone walls, which partially enclosed an irregular-shaped courtyard. Windows in the walls allowed glimpses of areas beyond, and one functioned as a seat. The courtyard partially enclosed by two dry-stone walls and surrounded by soft, billowing perennials planted in drifts. Behind one of the walls was an almost hidden garden with naturalistic planting. At first, I thought I had wandered into another show garden, but I liked the secret garden feel of it. A rich, copper beach hedge encircling most of the garden gave it a feeling of depth and warmth. It was particularly impressed that the design worked as a self-contained garden, but also allowed maximum viewing by the visiting public from the boundaries. An arch through the hedge of copper beech (Fagus sylvatica Purpurea) leading to the ‘secret’ garden. The IQ Quarry Garden, designed by Paul Hervey-Brookes, was a garden of two halves. Sponsored by the Institute of Quarrying to celebrate its centenary year, it represented the life-cycle of a quarry from pre-extraction to post restoration. 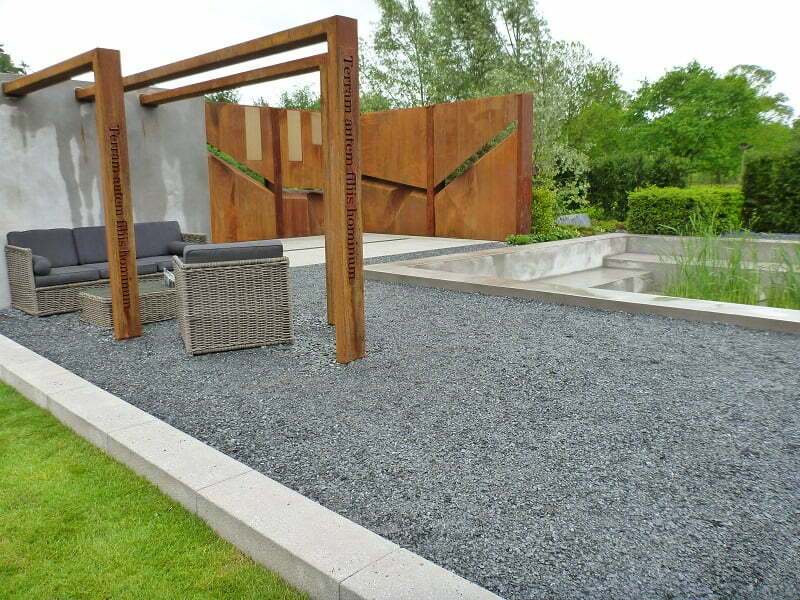 A large part of the space was deliberately stark, with concrete walls, slate and Corten steel and very little planting. Whilst I can appreciate that to some people the space and simplicity of this area would be relaxing, I much preferred the planted side of the garden. A mix of wildflowers and other bee-friendly plants were used to represent the reclamation of the site by nature after the end of quarrying. The judges awarded it gold and Best show garden. The stark side of the IQ Quarry Garden. 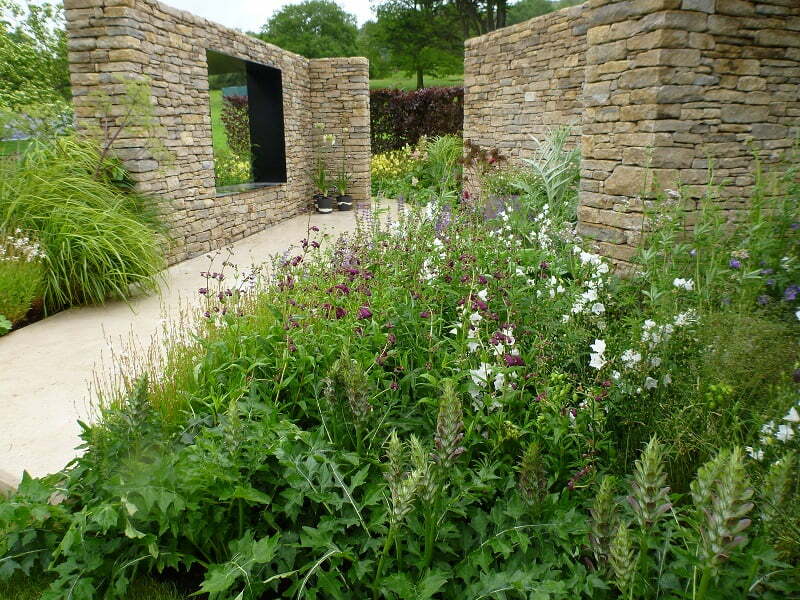 A mix of native and non-native, simple structured plants to reflect the plants that inhabit quarries once they come to the end of their working life. 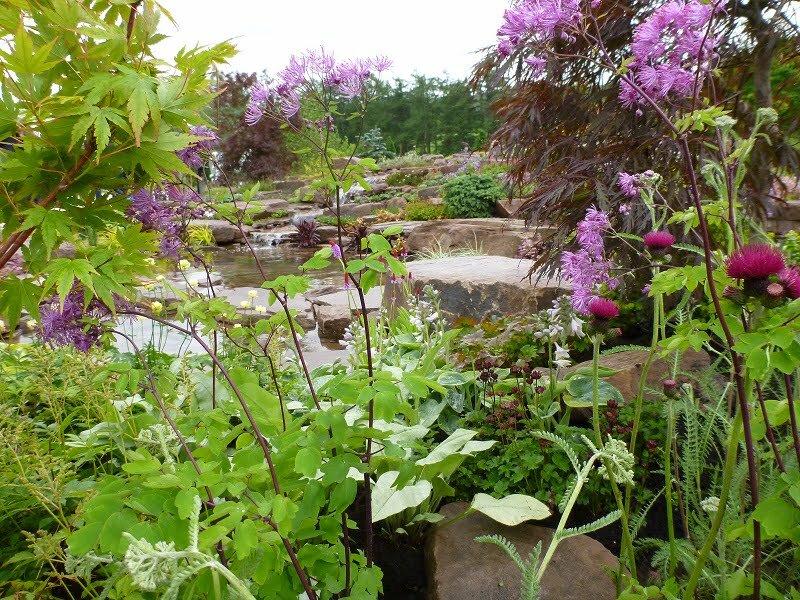 The Experience Peak District and Derbyshire Garden, designed by Lee Bestall and awarded Silver-gilt, brought a smile to my face, and had lovely views over the show and to the hills beyond. Who doesn’t want a gilded cow in their garden? The Belmond Enchanted Gardens, designed by Butter Wakefield, won a Gold medal and the People’s Choice award for the show gardens category. 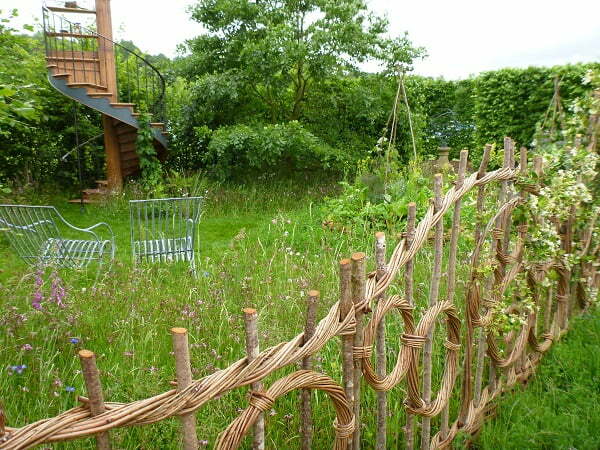 The artfully woven hazel and willow hedging enclosed a garden of wildflowers designed as a retreat for quiet contemplation. Is it worth booking a ticket for the Chatsworth Flower Show 2018? Absolutely. Despite the teething troubles, and the adverse weather conditions, I think that the RHS Chatsworth Show is going to be one not to miss. Genuinely inspiring to the ordinary gardener, and a great excuse to visit beautiful Derbyshire. Just pack your wellies in case summer doesn’t arrive in time for next year’s show.